The name “Wild Joe Baribeau” wasn’t the invention of a manager or publicity agent; he came by it honestly, being named by the newspapers of the day. 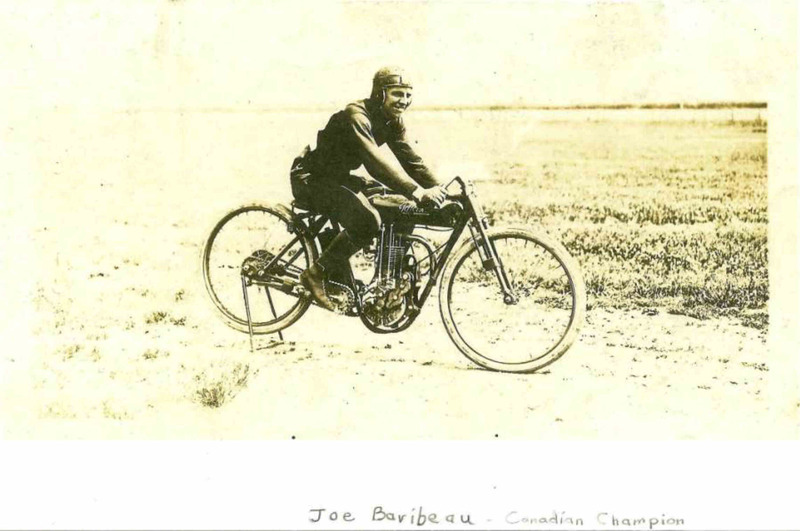 If the name Joe Baribeau isn’t familiar to most of us today it’s because a full 100 years have passed since his racing career was in its ascendancy, but his accomplishments are no less remarkable. Joe Baribeau was a homegrown hero of the stature of motorcycle racing legends like Maldwyn Jones, Cannonball Baker and Jake DeRosier, but he lived, worked and raced here in Canada. He overshadowed his rivals and earned nicknames like “Daredevil Baribeau,” terror on wheels” and “the new speed god.” He was the fastest man of his day, enjoying support from the mighty Indian factory and winning races in Toronto, Winnipeg, Detroit, Columbus and Toledo, Ohio, and other U.S. and Canadian events. Joseph Emile Baribeau was born in 1889 in Kenora, Ont., also the hometown of DeRosier, whose parents had moved him to the U.S. five years earlier. Joe started his working life as a boatman, building and operating motor launches and once hosting Queen Victoria’s third and last surviving son, the Duke of Connaught, who became Canada’s 10th Governor-General, in a cruise around Lake of the Woods. 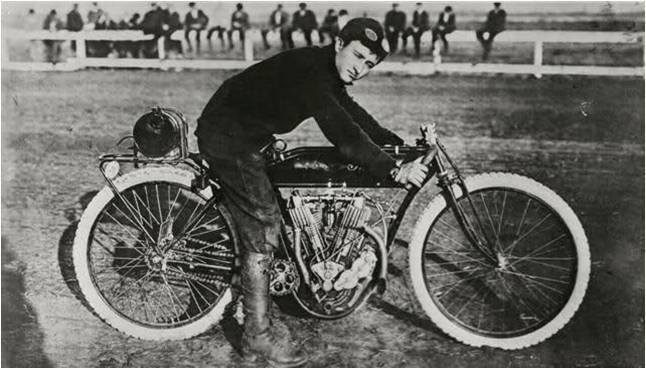 In 1910 at age 21 Joe moved to Winnipeg and made his mark as a rider par excellence, winning a five-mile dirt track race on the Kirkfield track at St. Charles, on the west side of Winnipeg. In September of the next year he also won at Kirkfield, setting a lap record for the mile at 56 seconds. His time for five miles on the twin-cylinder Indian was 4 minutes, 48 seconds and on a single-cylinder Triumph was 5 minutes, 25 seconds. The Winnipeg Free Press described his riding as “wonderful” and his lap times as “splendid,” being faster than any of the cars also on the program. 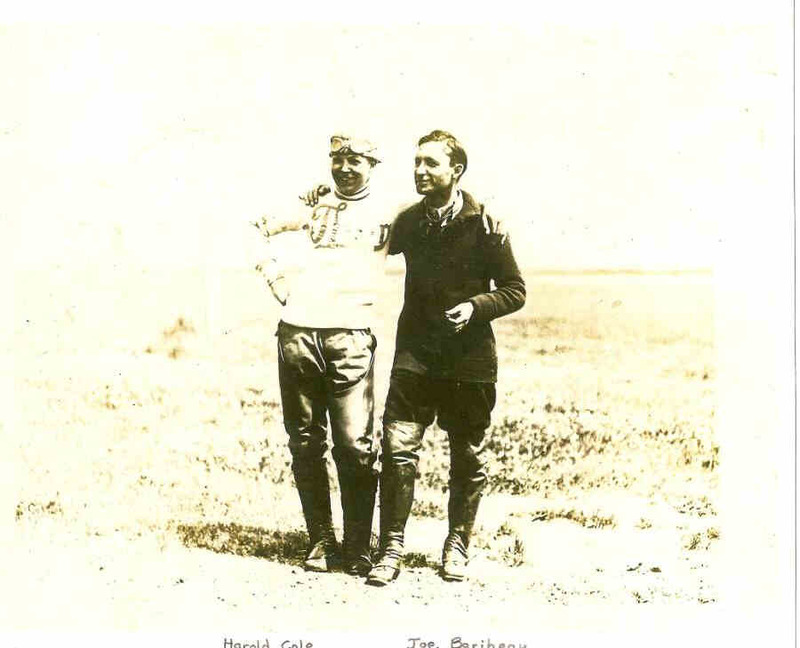 A month later, on Oct. 14, 1911 Joe set a world record by being the first to average 60 miles per hour over a distance of 100 miles. He had tried earlier in the summer but his engine seized, so he waited for cooler weather. His V-twin Indian was a pure racing machine, with no fenders, clutch, brakes or exhaust but with a rear rack that carried a large supply of oil to last the duration of the run. The oil reservoir was so heavy that it caused the bike to weave in the corners, and he stopped after one lap to lighten the load. Joe had to take a hand off the dropped bars to work a manual pump that injected extra oil into the engine. Refuelling was done at close to 60 mph by Joe grabbing a can of gas from another motorcycle that ran on the track beside him. His helper was an immigrant from New Zealand named Bill Pelham, later a famous racer in his own right. It was late afternoon on a chilly autumn day, and Joe’s hands were practically frozen to the bars. He covered an extra two miles to be sure of the record and then had to be lifted off the bike, so exhausted he couldn’t speak. The Indian factory’s support of Joe’s adventures was rewarded that same year when the Winnipeg police department ordered five new machines for its motorcycle corps. A photo of the patrolmen with the new fleet appeared in Indian’s catalogue for 1912. The number of motorcycles in Winnipeg grew rapidly from about 200 in 1910 to more than 1,000 by 1913, with 10 dealerships catering to the demand. Also in 1912, Indian opened a motorcycle assembly plant on Mercer St. in downtown Toronto and Joe moved east for a time. Since he was a paid factory rider, Joe was listed as a professional in the newly created racing category of the Canadian Motorcycle Association. He competed at the newly built Toronto Motordrome board track, rode in hillclimbs and raced on mile and half-mile dirt tracks, winning the Ontario, Manitoba and Canadian championships. It became common for the “peerless” Joe to clean up in every class he entered, and he became wildly popular with the crowds even if the winner was a foregone conclusion. He was a born promoter, racing against an airplane at CNE Stadium in Toronto and winning. He was also musical, playing mandolin in orchestras in Toronto and Winnipeg. Joe married Daisy Summers Steeple in 1913 and the first of their six children was born a year later. Then the onset of the First World War in August, 1914 changed everything; Joe moved his young family back to Winnipeg and announced his retirement from racing. He did go back to Toronto for a visit in the spring of 1915 to compete in a Victoria Day race on the dirt track at Exhibition Place where he won every professional event. From then on he operated an auto repair garage in Winnipeg. Joe Baribeau died in Winnipeg Oct. 6, 1950 at the age of 61. Joseph Baribeau passed away in 1950.